A brick of rounds for target practice--Remington does a good job making the ammo. You cannot beat these prices and service! My second order of 22LR. Fair price, thew it on top of my free shipping. Have used this ammo before and works the best thru my Ruger 22lr takedown. This is the best price I have seen for this ammo as well. No misfires, fail to eject or anything else. Cheapest 22 ammo I could find. Also had good reviews considering it costs 4 cents per round after shipping. can't beat the price and the s&h. The price, cheap ammo for kids. Good plinking ammo at a great price. Great price on quality product. it is a good value. Good shooting at a great price. Trial use. Heard a lot about the performance of this particular brand. I have always had good results with this cartridge. A great buy at this price and with granddaughters learning to shoot will be going through quite a bit of ammo. Awesome practice round. Dead reliable. After 5000 round, very few jams, no misfired at all. The ammo leaves a lot of lead in the barrel, so constant cleaning is a must. Great ammo at a great price delivered with great speed. This ammo shoots great out of my Ruger Mark IV, Hunter. great price. Hard to pass up. good price, and good service. Can't ask for more. Cheapest I have found online. Will buy more. Love these .22 shells, the only kind I shoot. Good plunking ammo great price! Shoots like expected. Been buying this ammo for about thirty five years. Nice , but they spilled all over in the shipping box. This goes bang most of the time. My SR 22 had 50% FTF or FTE with these. In a bolt or lever gun, you will be fine. Good price and just choose your platform. Yes I would recommend this product. Cant have too much 22 ammo. Quality and quantity for a great price, what more could a guy ask for? How about fast shipping too. You guys put great deals together with great service, that's why Grab A Gun is my go to place for all of my gun and ammo needs. Very pleased with the ammo. Only problem was the boxes were pretty beat up, had to tap them back together. Rough handling in shipping. Good deal shipping was quick. Everything I expect I will do more business in the future. Same Remington I've been using for years . Great for target / plink ammo. Or that pesky Squirrel, that won't leave the bird feeder alone. Damn tree rats!!!!! Good all around ammo st competitive price. Thanks GrabAGun, .22LR at pre Obama days? Not the best quality but it shoots and at prices around what they were before the worst 8 years of my life. I would have bought 100 boxes if I could, but 10 will do for now. There are once again kids across the nation learning to shoot and enjoying target practice. Cheapest I have ever seen .22 rounds for sure!! !......in my life! Great price that cant be beat! 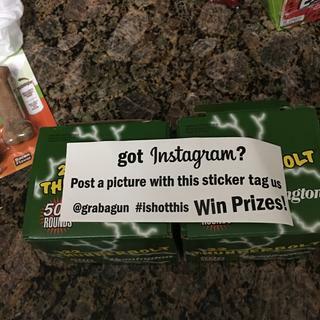 Grab a gun was without a doubt the best and cheapest store I have ever purchased ammo and guns from. I bout 10,000 rounds of .22 ammo and so far they shoot just fine.....no problems at all!!! Several ftf but decent ammo for the price. Great price and I find these 22’s reliable. As for grabagun, I’m so glad my friend told me about you. Always great customer service. Friendly, reliable, helpful and the best prices. 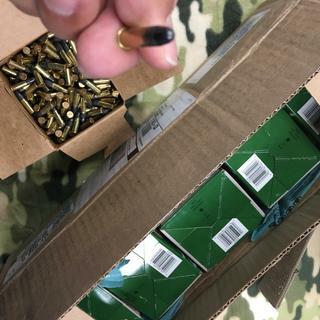 Best ammo for the price!!! Amazing for practice at the range. Best ammo for the price!!! It's works good on Pistols: Browning Buckmark, Ruger Mark II, S&W 22A-1 and Model 41, GSG 1911 22, High Standard Sport King. Awesome price for this many rounds! My Ruger 10/22 they perform well. They are accurate and can be counted on to fire every time. When I use the 25 Round magazine they feed perfectly. All in all a great product. Ammo works real well no issues and an awesome price. Great range ammo. Used in bolt and semi auto with great success. Thunderbolt is perfect plinking, practice round. Clean often due to lead head but great for what it needs to be. This ammo shoots very nicely. A favorite of 22 shooters worldwide, the 40 grain, round nose, 500 round box of .22LR ammo is Remington’s best-selling and most popular round of all time. With a price that can’t be beat, stock up and save with flat rate shipping from GrabaGun. Stock up and save with flat rate shipping on ammo.